For the past 35 years, Ipsos MORI, the UK market research company, has undertaken a survey of which professions in Britain people trust. Each year, they ask 1,000 people whether they trust people in different professions to tell the truth. Every year, close to the bottom come business leaders, just above estate agents, professional footballers, journalists, and politicians, below trade union leaders and “the man in the street”, and usually even below bankers. Mistrust in business is pervasive, persistent and profound. Over the last few months, we have seen leaders around the world responding as never before: In France, President Macron has defined a new class of company with “raison d’être”. In the USA, Elizabeth Warren has proposed an Accountable Capitalism Act that would impose public charters and German-style co-determination on the boards of large US corporations. In the UK, the Labour opposition party has been galvanizing popular support for nationalization, employee ownership, and board representation, and the UK Financial Reporting Council has proposed a new Corporate Governance Code around corporate purpose. Rarely has there been such global recognition that there needs to be a fundamental change in the nature of the corporation. So why is there such mistrust in business? The so-called Friedman Doctrine is embedded in business practice, policy and education around the world. But it was not always like this. For nearly all of its 2,000 year history, the corporation has combined a public purpose with its commercial activities. It is only over the last 60 years that the idea that profit is the only purpose of business has emerged. The consequence has been a growing conflict between business and the rest of society. This conflict – and the consequent erosion of trust — is well illustrated by the steady decline of corporate tax payments. Globalization has made it increasingly straightforward for companies to locate their tax domicile and taxable profits where their corporate tax liabilities are minimized. The result is that many companies end up paying taxes that are small in relation to their activities and earnings in a particular jurisdiction. A report in the Financial Times (11 March 2018) revealed that the effective corporation tax paid rate by the world’s ten largest companies (as measured by their market capitalization) has declined by 9% since the financial crisis. In fact, profit primacy imposes an expectation on directors to minimize their tax liabilities to maximize their shareholder interests. When ownership of companies was concentrated in the hands of a small number of family members in Britain at the end of the 19th century, families’ concerns about their reputation and social standing encouraged some companies (such as Cadbury, Lever Brothers, and Rowntree) to display good citizenship. But with increasing dispersion of shareholdings amongst financial institutions, it has become easier for shareholders to hide behind a veil of anonymity and lack of accountability in seeking minimization of corporate tax liabilities to maximize their wealth. Where should we look for answers? Limited liability means that the private assets of shareholders are protected from creditors in the event of bankruptcy, and only the money that they have invested in a company is at risk. It has promoted entrepreneurship, investment, and R&D on a scale that would have been inconceivable if shareholders’ personal assets had been at stake, and it has encouraged the development of liquid stock markets that allow shareholders to trade their shares at low cost. But as the 2008 financial crisis demonstrated, it means that societies and in particular taxpayers are exposed to bailing out failing industries such as banking during periods of financial distress. If companies enjoy this public insurance in bad times, they should bear a corresponding responsibility to contribute their fair share of taxes during good times. “Fair” should be measured by the average rate of corporation taxes that companies pay globally on the profits they earn over a number of years. The payment of fair taxes should be enshrined as part of a company’s purposes and licence to operate. Corporate taxation should not be classified as a cost to be minimized for the benefit of shareholders but as the contribution, along with profits, that business makes to society as a whole. Recognition of fair share of taxes as part of its corporate purpose is one of the most important contributions that business itself can make to regaining public trust. Featured image credit: Building Glass Architecture by Mikes Photos. CC0 via Pixabay. 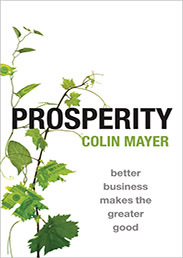 Colin Mayer is the Peter Moores Professor of Management Studies at the Saïd Business School at the University of Oxford, and the academic lead for the British Academy's Future of the Corporation research programme, which addresses the changing relationship between business and society.